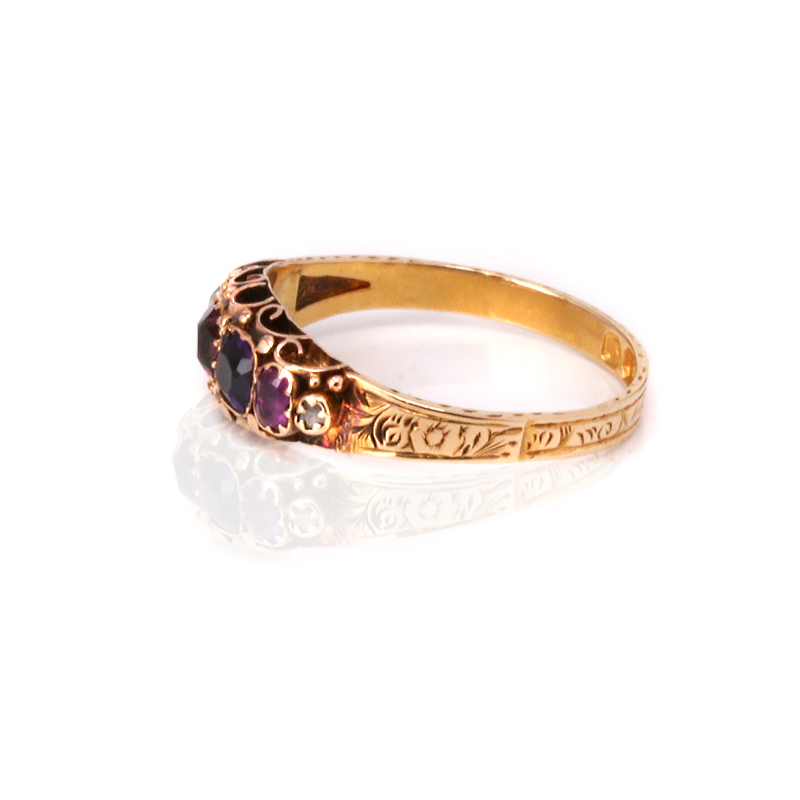 Product code: ES7324 Categories: Antique, Antique Rings. Acrostic jewellery is one where gemstones are used to “spell” out a word such as can be seen here in this very attractive antique Regard ring made in 1897. This Regard ring from the late Victorian era is made in 18ct gold and set with a Ruby, Emerald, Garnet, Amethyst, Ruby and a Diamond in a line design where the gemstones not only look stunning and vibrant but also graduate in size. Even the setting has so much detail with the most elegant scroll work combined with hand engraved shoulders. Often given to a loved one, there is so much romance in many antique pieces of jewellery and acrostic jewellery such as this is certainly no exception and this ring will make a wonderful conversation starter. Genuine antique Regard rings are becoming so increasingly hard to find, and this one is in wonderful condition which is also a testament to the jewellery that was being made over 100 years ago. From where the gemstones start across to the other side, this distance measures 15.8mm by 6.3mm wide at the centre and feels so comfortable to wear on any finger. This late Victorian antique Regard ring is just so elegant and combined with the romance makes it even more special. Antique Regard ring made in 1897. 18ct gold acrostic ring from the Victorian era. Other romantic sentiments found in acrostic jewellery can also be found in the form of ‘dearest’ and ‘adore’ jewellery. J’adore (love), was spelled out in a ring with jacinth, amethyst, diamond, opal, ruby and emerald gemstones, set in that order. Sometimes, the gems would be interspaced with seed pearls representing tears. Many rings and bracelets were also made in which stones spelled out the names of loved ones a number of items commissioned by Napoleon Bonaparte, for example, used this formula in charming ways. Napoleon and his wife Josephine Bonaparte and the date 15 August 1802, commemorating the simultaneous nationwide celebration of Napoleon’s 33rd birthday and his elevation to Lifetime Consulate status. His second wife, Empress Marie Louise, had three acrostic bracelets made by Chaumet. The stones spell the first names and dates of birth of Napoleon and Marie Louise, and the dates of their meeting and subsequent marriage in 1810.